First taste of breakfast that we did not have for 3 days was at Anju Sherpa’s place in Lukla. Even though it took 40 minutes to get what we wanted, it was worth the wait. What I like about Nepal and its people, is that they are extremely eco-friendly and the trek route is very clean, so are the hotels/lodges the entire route. It was time to start the trek, our initial plan was to stay in Phigding/Fagding but since we had reached early and the fact that we had lost 3 days at the airport we decided to trek ahead to Monjo. The total trek time for the day was 8 hours, weather was excellent and very clear and we would be gaining an altitude of 2900 mts. The landscape was beautiful, hill covered with lush green carpet, pine trees, beds of high altitude flower, Dodh Koshi gushing between the valleys all was picture perfect. The trail went up and down the mountains, crossed over from one hill to another across the river, all looked like shots of Yash Chopra’s movies. Good dinner and a long rest was all we wanted, and next day we were up by 6.30 am. The plan was to hike up to Namche in 4-6 hour duration, so we started of at 8.30 am. 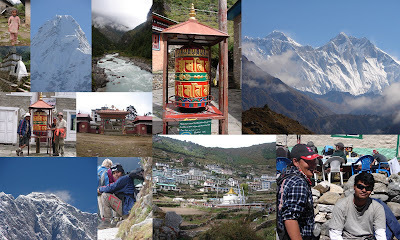 The hike to Namche is quite steep, and would be reaching an altitude of 3542 mts. The view en-route was only getting better, Dodh Koshi literally lives up to its name, gushing down aggressively, looking milky white. All through the trek we crossed hanging bridges across Dodh Koshi and its tributaries from hill to hill. For the first few hours I was with the group, as they slowed due to the steep climb. I hiked further without stopping as I needed some exertion and reached the entrance of Namche, which is a tea stall by 12.45 pm. Richard and his dad joined me for tea, we started talking about the trek, Richard’s dad is 74 years old and it was his 3rd time to EBC. It was also amazing you know that Richard’s brother was leading an expedition to Mere Peak and Island Peak that is in the same region at the same time. They left after tea and I continued to wait for the group. As the rest of the group arrived, we moved to Hotel Tibet, a beautiful place that gives the best view of Namche. Since most of us were completely exhausted and climbing up 2 levels to our rooms did not make it easy. Namche is almost like a “Big Town”, with several travelers it at some point looked like Thamel. On the way to Namche we met people from many nationalities but not a single India yet!! We are so close to Nepal and do not even need a visa yet Nepal looks a distant place. I met a Sri Lankan who came up to Namche but ended up returning to Lukla on a horse back :)…..guess high altitude for a guy for the land of beached was…. At dinner time, the hall was filled with people, some returning from the trek, but majority would be trekking with us. I was sitting close to a table where a group leader was briefing the team about the trek ahead and the group was asking the most stupid questions. In the gang some of them had lost apatite, which is common in high altitude, but had to eat as much possible to gain energy that would be needed the most ahead. Morning I woke up to the mist covered mountains and to a yet to awake Namche. I spotted a few foreigners doing yoga; it’s extremely helpful at high altitudes. The breathing technique in yoga comes in handy during steep climbs and faster gain in altitude. I tried thinking about something back home or work, nothing just seemed important at the moment. The fact that the mountains overwhelm me so much, my mind was oblivious to anything else. It was a free day; it was around 8 degrees we trekked up to Everest View Hotel, 900 mts higher and gives a peek-a boo of Mt Everest, Lothse and rest in the range. After a steep climb, it got cloudy and we hoped it would clear by the time we reached the view point, but it got worst. We descended back to Namche just in time to miss the light showers. At dinner time Maila briefed us about the plan for the following day. We were to start off early at 7.30 am, right after breakfast. Namche is very clean, it had internet services, Banking, Massage centers, and Printing services but quite expensive until one is really desperate. People of Nepal over a period of time have understood the requirement of the trekkers and mountaineers, and have build facilities to address every need. They have adapted to the global culture in the true sense. Hotels are well maintained; food not only freshly cooked but truly satisfies people from any part of the world. As a policy the prices for the rooms, shower or even food is standardized, this is extremely good as there is only a certain season they can earn money and a community based approach ensures that every one gets their share of the revenue. It’s a long term sustainable model and a win-win situation for the people, community and the travelers. Morning the sky looked beautiful and clear than ever, the mountains very covered with fresh snow. Sun slowly showed up, and we hoped to have a good long trek. As per the initial plan we were to trek to Tengboche for the night but we were good to trek further to Pongboche. We started off as per last night plan; the first turn up from Namche gave the 1st view of Mt Everest and Lothse and one cannot miss that. The view was on and off as we trekked through the trail. Shabna was not doing well and she was slowing down. To reach even the lunch point which was down hill we took 4 hours. I was worried about reaching Pongboche on time, rather before the weather gets colder. We reached Tengboche and stopped for an expensive hot chocolate. Tengboche had a large colorful monastery that stands out among the hills. We moved ahead hoping to reach Pangboche in the next 2 hours, but our porters had fond a place to stay at Deboche and it was great relief. It was a small place, but given the altitude a roof over the head and four walls around was all we wanted. We sat around “Chilok” (fire place) taking up all the heat we could and finished our dinner. We had only 2 rooms and the 3rd was a tent outside!! Since Subbu and Me have been in the mountains long enough to take the cold, we took the tent and no regrets, I feel asleep in no time. Morning as I came out of the tent I saw the hump of Mt Everest clear from the clouds, it was beautiful, it was like a dream come true to wake up to Mt Everest. It was worth taking a zillion pictures, but I knew it will only get better from now on. We started to move at 8 am, and all of us needed a good warm-up from the still cold morning. The cliff of Amadablam was intimidating, a 7+k peak looked beautiful, tall and all white from top to bottom, it was following us on our right-hand side. On the way I met Ashok Srishista a guide for a little lady from Poland, he is a huge Hindi movie buff, and was more then thrilled to sing and dance to kai kay pan banaras wala….We trekked up to Pongboche in 2 hours and later to Shomare for lunch, it’s a small place with tons of trekkers both going up and those who are coming down. I wish I would write more about each of the mountains, they simply overwhelm and make one speechless rather wordless. I had never seen the sky so blue; the pure white clouds were rising up behind us and the clear blue sky ahead of us. As we progressed to Dingboche the terrain got wilder, the mountains caved into the valley, Dodh Koshi was gushing stronger. The landscape was losing the green; the mountains looked closer, cold wind was unbearable even at 2 pm. Even though the trek was not tough the spiraling around the trek path getting rockier was making it difficult. We managed to reach Dingboche by 4 pm, and in no time the clouds settled down and made the place invisible. All through the trek even with many trekkers the place was peaceful, serine. One very visible aspect was that there were a lot of women trekkers, some times they out numbered the men; one was as old as 62 years, I even met 3 moms with 3 daughters!! The sutpas with Buddha eyes had got replaced with memorials, frequency of choppers for rescue increased. The obvious symptoms of the trek ahead and the tough days to come!!! During dinner we sang few Hindi songs, the foreigners joined too and got one of them to sing a French song. Post dinner Sri and Ajit came up with the idea that we should trek to Dughla the next day instead of staying in Dingboche for acclimatization, I was complete against it given the problem we could face in case of any medical emergency, but they decided to risk it out anyways. Morning Sri & Ajit left to Dughla, Shabna did not look good at all, and she started to trek with us but went back. Subbu, Keyur, Maila and me continued our long trek up for acclimatization. The plan was to go up to a small hill called Chgukhung (not the main peak) which is 5100 mts and reach back to spend the night at Dingboche. The gusty winds were blowing us up endlessly on a complete rocky terrain, when we were at the top of the hill I almost lost balance more than 5 times; the wind at the speed is scary. The hill was the closest we could get to Lothse, from tomorrow we will be turning away from Lothse and we would have Nuptse and Everest ahead of us. I was slightly worried, Shabna was not acclimatized, Sri and Ajit left to a higher altitude without proper acclimatization. Next morning as we moved towards Dughla, Shabna looked really sick, she was very determined but her body would not take her any further, and decided to return. A hat off to this lady, she with asthma completing 70% of the trek is “something”. We made it to Dughla, Sri and Ajit joined us, they seemed ok and we trekked further towards Lobuche. I was slightly cut-off, Shabna was still on my mind, and the trek route was heaps and heaps of rocks and pebbles. The trek was getting tougher now, we heard stories of people moving down, rescues, sickness but we moved on with no fear. By lunch we were at Lobuche, it was a very difficult accommodation, may the only one we had to survive. For the first time we met people from India, it was a family Wife, Husband and their 14 year old son had braved it to reach Lobuche. I was delighted to speak with them, and they told us that there was a group from Pune and 3 more people from Bengal. We ordered for food and played cards; spoke with many people, some of them who would be travelling to India. Subbu and I had got better rooms compared to Sri, Ajit and Keyur and I dozed off without trouble.